Parc des Buttes Chaumont sits near Belleville and since I was in the neighbourhood for lunch today (excellent authentic Thai food, if you’re wondering), I could not resist taking a walk there for some post-lunch afternoon stroll. Not longer as off the beaten path as it used to be – yes, tourists have discovered this little gem in the north-east of Paris, although they seem to head straight only for the belvedere – it is still one of my favourite places in town. Perhaps it is the memory that I’ve attached to the park. 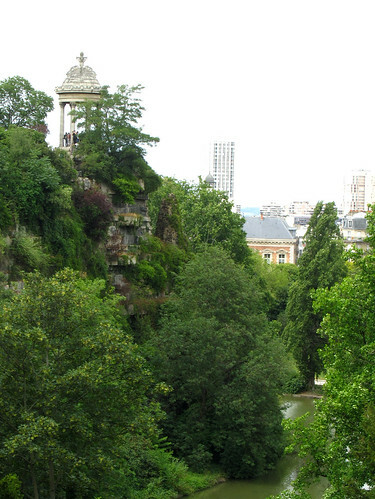 I was visiting Paris one summer before heading to Italy, staying with a friend, and for the first time, explored the city extensively by car, and the park was one of our visited places. I remember us sitting on the slopping hill, basking in the sunshine while talking about our dreams and aspirations for the future. How simple life was back then. I was idealistic, naive even, with so much I aspired to do. It was very good time. thanks, but i think there’s a better angle to photograph the park to improve the shot.